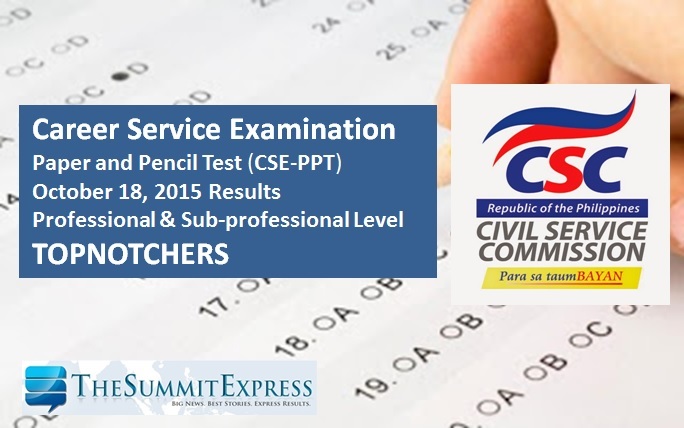 MANILA, Philippines - The Civil Service Commission (CSC) announced that a total of 13,152 examinees passed the Career Service Examination-Paper and Pencil Test (CSE-PPT) held last October 18. Region 7 (Central Visayas) got the highest passing rate at 14.28% or 1,429 passers out of 10,010 examinees. Louise Marie Loreno from Davao Region and Lonn Albert Chong from Caraga led the 11,364 new professional eligibles with a rating of 86.99. For the subprofessional eligibles, Estelle Kathleen Castelo from Southern Tagalog took the top spot with a rating of 90.98. The full list of topnotchers will be posted on this page once available online. According to the CSC, Region 7 (Central Visayas) got the highest passing rate at 14.28% or 1,429 passers out of 10,010 examinees. Other top performing regions of the country in terms of passing rate include Region 3 (Central Luzon), 14.02%; Region 4 (Southern Tagalog), 13.71%; Region 6 (Western Visayas), 13.43%; and Region 5 (Bicol Region), 12.34%. The total number of passers represents 11.02% of the 119,333 total examinees for both the professional and subprofessional levels. The figure does not include, though, some 56,985 registered examinees from areas where the examinations were suspended and re-scheduled to December 6 due to recent calamities. These include all testing centers in Regions 1, 2, National Capital Region (NCR) and Cordillera Administrative Region (CAR), and those in Olongapo City, Cabanatuan City, and Bongao in Tawi-tawi. All examinees may generate their individual test results through the Online Civil Service Examination Results Generation System (OCSERGS) available by Dec. 14, 2015 and thereafter. Certification of Eligibility for passers (printed on CSC letterhead, free of charge) shall be available by January 4, 2016 and thereafter. Passers may also opt to apply for regular Certification of Eligibility (printed on security paper at cost). The CSC said the new subprofessional eligibles are qualified to enter the first level of government service, while the professional eligibles may join both the first and second levels. The first level includes clerical, trades, crafts, and custodial service positions that involve non-professional or sub-professional work requiring less than four years of college studies. The second level covers professional, technical, and scientific positions up to Division Chief that involve professional, technical, or scientific work requiring at least four years of college studies. However, the CSC clarified that professional or subprofessional eligibility is just one of the requirements to join the government. A civil service eligible must also meet the education, experience, and training requirements for permanent appointment to a government career service position.